There are many sled runs. 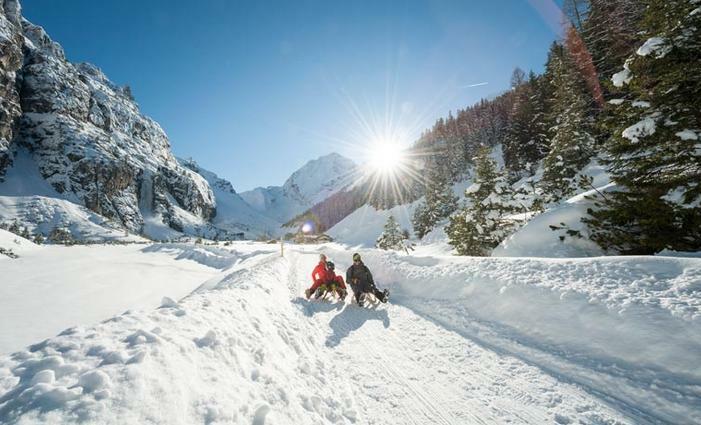 But only few are as picturesque and as long as the Elferlifte Neustift sled runs. With their 8 km descents through the idyllic Tyrolean mountain forests the runs are among the longest in Tyrol. Night sledding is particularly atmospheric on the Pinnis sled run that is illuminated with petroleum lamps. The sled run to the centre of the village is, of course, also illuminated. 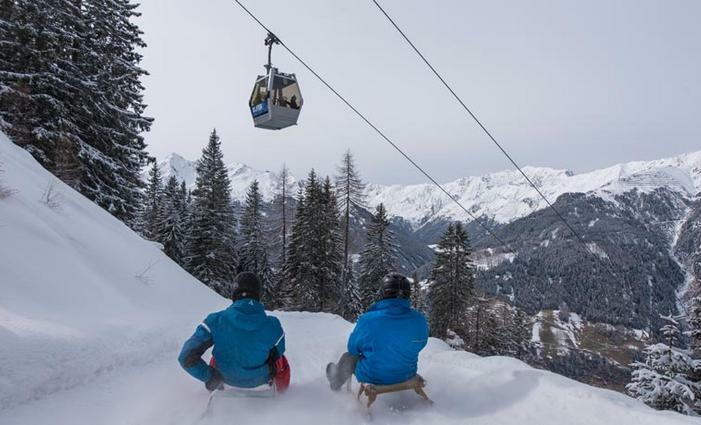 All three runs have been awarded the Tyrolean nature toboggan run seal of approval. Toboggans can be hired directly at the lower terminus of the Elfer gondola lift. Night tobogganing takes place on Mondays, Wednesdays and Fridays, depending on the snow conditions. More information can be found in the blue info box on the Home page. NOTICE: In case the toboggan runs are closed, no transportation of toboggans or similar sports equipment will be provided. The longest toboggan run in the Stubai Valley that is lit up, prepared and covered with artificial snow. The 8 km-long toboggan run from the Elfer leads directly into the centre of Neustift to the lower terminus of the Elfer gondola lift. The toboggan run is lit up at night three times a week (Monday, Wednesday, Friday from 7.30 pm to 1 am). During the day the toboggan run is open from 9 am to 5 pm. The toboggan run is prepared perfectly by the snow groomer and is very safe. 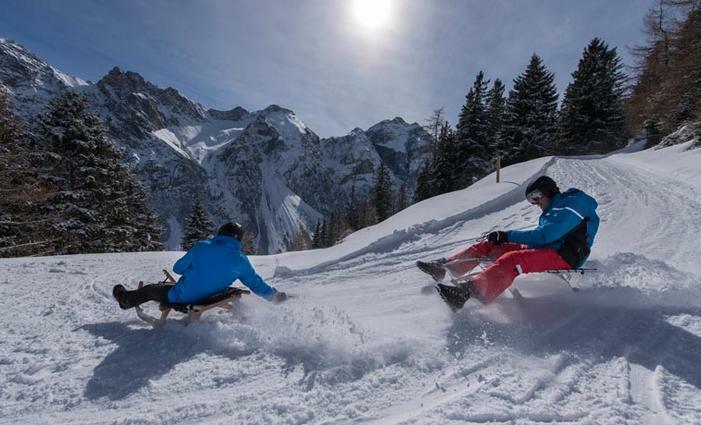 The toboggan run has been awarded the Tyrolean nature toboggan run seal of approval. The toboggan run from the Elfer through the Pinnis Valley, also 8 km long, ends in the Neustift-Neder district, approx. 1 km from the lower terminus of the Elfer gondola lift. From the end of the run, an Elfer toboggan run bus brings you back free of charge to the lower terminus at 2 pm, 3 pm and 4.15 pm. As an alternative you can also always walk for approx. 20 minutes along the even footpath across the fields. The toboggan run is lit up at night three times a week by paraffin lanterns in the form of orientation lamps (Monday, Wednesday, Friday from 7.30 pm to 10 pm). Taking an additional headlamp is recommended. Tobogganing is allowed daily from 1st December to 31st March from 10 am to 5 pm as well as on the toboggan evenings (outside of these toboggan times residents' cars are allowed to be driven here from 6.30 pm to 7 pm and from 2 am to 10 am). You first take the Elfer-Pinnistal toboggan run and toboggan down approx. halfway to the Issenangeralm. It takes approx. 1 hour to walk along the even path to the Pinnisalm. As there is no lift at the back of the Pinnis Valley, there is much less "toboggan traffic" here. You can thus enjoy the quietness and the snowy mountain scenery. This variation is particularly recommended for families with children. The landlord of the Pinnisalm ski hut offers a "toboggan safari": At 12 midday he tows you and your toboggan from the Issenangeralm to the Pinnisalm by means of his jeep and three sledges on which seats have been fitted. In the upper section - from the Pinnisalm to the Issenangeralm - tobogganing is allowed from 1 pm to 5 pm; in the lower section - from the Issenangeralm to the end of the run - from 10 am to 5 pm as well as during the evening on Monday, Wednesday and Friday from 7.30 pm to 10 pm). Only single trips, evening tickets or 10-ride tickets as well as the annual or the Elferlifte season ticket and the Freizeitticket Tirol are valid for the night sledding event. The Stubai Super Ski Pass, day and multi-day tickets as well as all Stubai Season Ticket are not valid.